Tuesday was Independence Day. 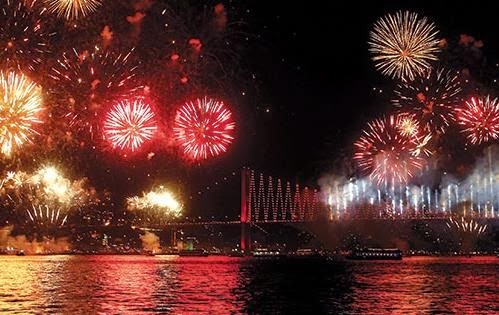 Well, in Turkey, 29 October is officially Republic Day, but it’s like Independence Day, Thanksgiving, the Queens Birthday, VE Day, Guy Fawkes Night and Bastille Day rolled into one. Major celebrations are held all over the country to commemorate the day in 1923 when the Republic was officially proclaimed. This year the date took on special significance as the 90th anniversary, and in the wake of political demonstrations during the summer when some citizens voiced concerns over perceived threats to democracy and the sacred heritage of the Republic’s founder, Mustafa Kemal Atatürk. Our district is an enclave of determined Kemalist Republicanism in a city whose politics are dominated by the Justice and Development Party, which also forms the national government. Baghdad Avenue, six kilometres of trendy bars and cafes, upmarket restaurants serving international cuisine, and purveyors of brand-named goods and apparel local and imported, has been readying itself all day for an evening of joyous celebration. From windows and balconies, lampposts and cables stretched across the avenue, red flags sport the white star and crescent, and banners bear likenesses of the great Father of modern Turkey. On every corner, street-sellers provide more of the same in sizes and prices to suit every pocket. As for me, I am heading across the Bosporus Strait to the European shore, and the first stage of my journey is a bus ride to Kadıköy where crowds are already thick by 5pm. Kadıköy has been a Christian settlement since the early days of that religion’s adoption by the Roman Empire. The Ecumenical Council of Chalcedon was held here in 451 CE, and even today, churches, Armenian and Eastern Orthodox, outnumber mosques. For that reason, attitudes to the consumption of alcohol are more relaxed than in traditional Muslim areas, and scores of bars, restaurants and cafes, old-style cinemas and a recently renovated opera house make it a popular resort for Asian Istanbulites seeking a night on the town. But not for me. At least not tonight. A twenty-minute ferry ride and a quick trip on Tünel, the world’s second-oldest (and its shortest) subway train, bring me to the lower end of Istiklal Avenue, one-and-a-half kilometres of seething crowds pursuing an evening of festivity in Istanbul’s premier entertainment district. More so even than Kadıköy, the area known variously as Pera, Galata and Beyoğlu has long been the European face of this gateway city to the East. Here merchants from Genoa, Venice and other parts of Europe came hunting fortunes even in the days of Byzantine Rome, long before the Ottoman conquest, when the city was undeniably Constantinople. In later centuries, after it became the Ottoman capital, envoys from the Christian powers of Europe, denied the right to live within the walls of the ancient city, established their ambassadorial palaces here and watched the sun sink behind the domes and minarets of the exotic skyline, turning to flaming orange the narrow stretch of water they named the Golden Horn – no doubt to the perplexity of Ottoman citizens to whom its colour probably more closely resembled the muddy brown of the River Thames. The ambience in Istiklal Avenue is markedly different from that on the Asian shore I have just left. Here youthful pleasure-seekers skirt around tank-like vehicles bearing bulldozer blades in front and water cannon in turrets on top; or jostle their way past armoured police toting long batons and carrying shields and helmets. Perhaps surprisingly, the mood seems quite relaxed, and officers of the law lounge in doorways or squat on the footpath conversing quietly with their mates as the crowds move around and past them. My own course takes me to the North Shields, a replica English pub where I am to meet Robert, my English friend from Selçuk. We sip Turkish beer and chat for an hour or two before I begin the return journey home. Istiklal now is remarkably quiet, though perhaps most of the throng have settled into their own watering holes, or found somewhere else to join in the patriotic festivities. I have just missed the last Tünel train, so I amble down the hill past the 800 year-old Galata Tower, built by those Genoese in 1348. A decade or so ago I might have thought twice about braving this street alone after dark – but now it is well-lit, lined with small shops selling handcrafts and objets d’art, more cafes and bars, and filled with passers-by, and I make my way without let or hindrance to the jetty on the Golden Horn where I will board my ferry. Five bridges now span this narrow inlet of the sea, in Byzantine and Ottoman times a bustling harbour and port. The crossing beside my jetty is another thoroughfare of restaurants where tourists and Turks alike regale themselves with fish and rakı (or wine, or beer) as they watch the ferries disperse reflections of illuminated imperial mosques in the now black waters. My ferry casts off, and soon we are cruising past Seraglio Point and the walls of Topkapı Palace, from where Ottoman Sultans ruled an empire exceeding five million km2 in area at its apogee in the late 17th century. Soon the immense dome of St Sophia comes into view, the 6th century Roman cathedral that was the largest church in Christendom for a thousand years, and a mosque for another five hundred, before being reincarnated as a museum by that courageous gentleman Atatürk. Next door is the less ancient but still impressive ‘Blue Mosque’ of Sultan Ahmet I, its six minarets asserting Islamic superiority over its older convert neighbour. Nearing Kadıköy we pass the cranes and lights of the modern container port, then the chateau-like architecture of Haydarpaşa Train Station, built by friendly Germans in the early years of last century as an important staging post on what was planned as the Berlin-Baghdad railway. The First World War saw Germans and Ottomans share a losing fate, and the project was never completed. Baghdad Avenue, however, serves as a reminder of where we now are, geographically speaking – though the distinctly secular festivities still in progress indicate that Ataturk’s legacy produced a democratic republic somewhat different in character from its Middle Eastern neighbours. My dolmuş driver informs us passengers that he will not be able to reach the normal terminus of his route as police have closed the roads. Fully expecting to see a war zone of raging protesters, clouds of tear gas, respectable aunties with slingshots and innocent young women in red dresses felled by the water cannon of anonymous robo-cops, I set off to walk the last two kilometres home. No such thing eventuates. The bars and cafes of Baghdad Avenue are overflowing with goodwill, the footpaths still thronged with happy flag-waving patriots, as modern arrangements of revolutionary marches boom out from banks of speakers on the open-air stages. God bless Atatürk, I say, and long live the Republic. 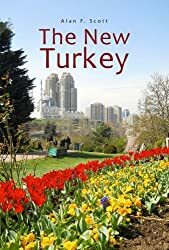 For all the destructive talk about dictatorial Neo-Ottoman aspirations and the return of Sharia Law, I can’t see the great man’s achievements being undone, and I believe Turkey will continue to shine as a beacon of hope and possibilities in this troubled region. This entry was posted in Atatürk MK, Constantinople, Istanbul, Turkish Republic. Bookmark the permalink.